Before the archetypal FF aeromodeller is allowed through the Pearly Gates, there are a few models that he has to have built to qualify for entry. 'Now is the time' , the Walrus said, to almost complete your task list and it came to pass that a Butterfly plan was acquired and work commenced to attempt to emulate one of, if not the most successful PMFC competition model of the past 35 years. 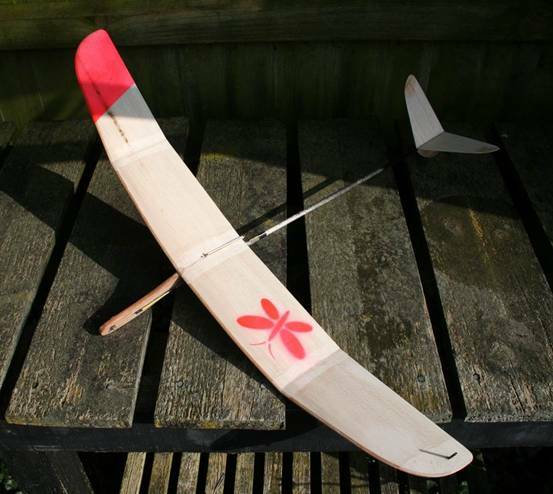 Twenty hours later a Butterfly DLG emerged from the balsa dust and debris. The Master scrutineered my effort at the last Peakirk clubnight and apart from a few minor issues pronounced it mildly worthy. ..Some minor modifications and detail explanations follow. 1. 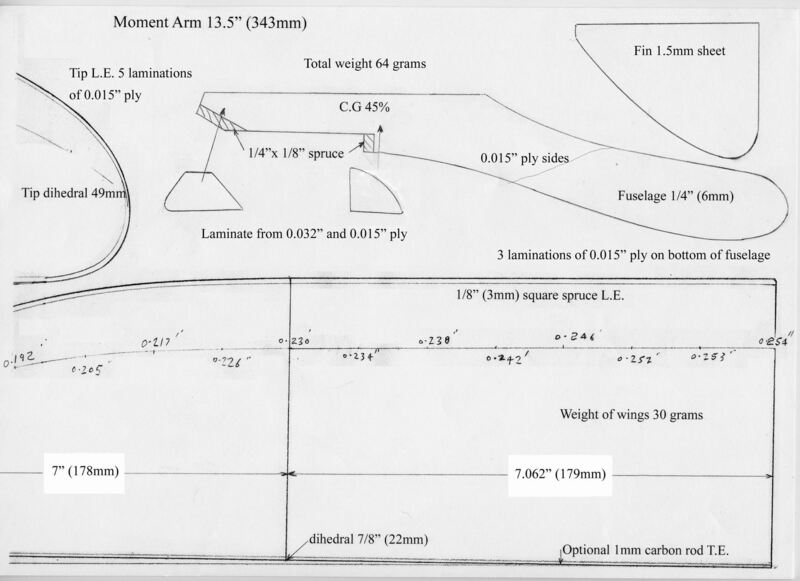 Increased span from 27 to 30" retaining the asymmetric port wing (1" longer than the right) Or should this be 25mm? 2. The underfin is glued on the left side of the boom. 4. Model uses a viscous micro DT device operating on a brake back fuselage with incidence setting on a 10BA setscrew. 5. Tail end stab/fin angles are 60/60/60. 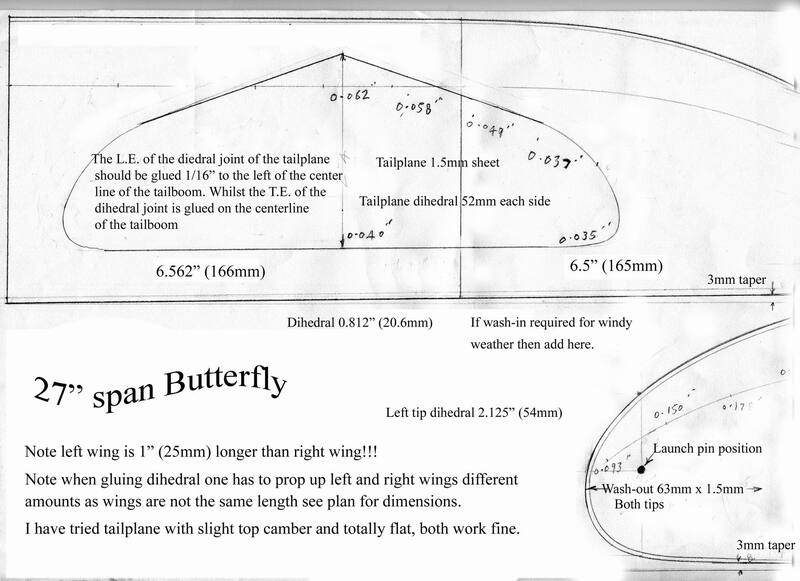 Wing panel angles to the horizontal are 4/18 degs approximately. This is not a change to MP's plan, just an advisory in case you want to build to angles rather than a linear dimension. 9. A stab incidence of -1.5degs is about 2mm difference between stab LE and TE using a steel rule from wing lower surface to stab. 1. Use of the thick end of a Skyshark 8gm 2PT carbon kite boom. Very stiff but not light. 2. Use of a fillet of epoxy/microballoons to attach the V-tail to the boom. Should have been CA/lightweight glass and sparingly applied. ..74gm RTF and MP quotes 65gm. Moral is to use a decent DLG boom from Flitehook and try CA/ lightweight glass to attach stab. ..minimal damage but viscous timer covered in mud and boom brackets broken. Following repair I will wait the wisdom of 'The Master' before attempting further shenanigans. I now have only a Cloud Tramp to build to complete the mandatory aeromodelling set. Needless to say I am never ever going to build this and thus am very likely to live forever?